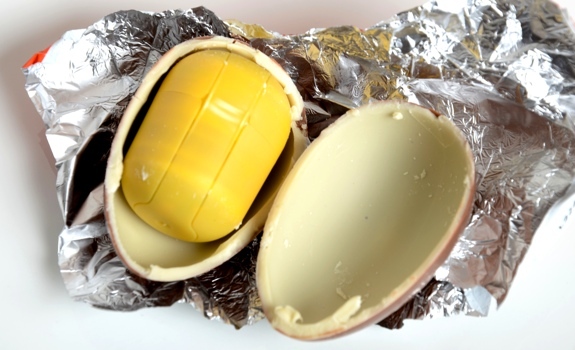 A Kinder Surprise chocolate egg, in foil wrapper. They’re an Easter season staple in Canada and in many other parts of the world, yet they’re banned in America. 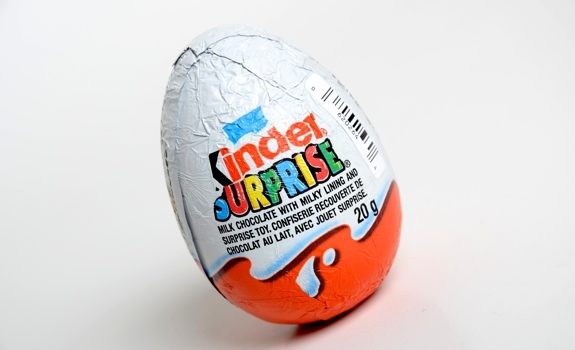 While the Kinder Surprise menace is apparently clear and present, I’d venture there are at least a handful of greater threats to U.S. national security than chocolate eggs with toys inside them. 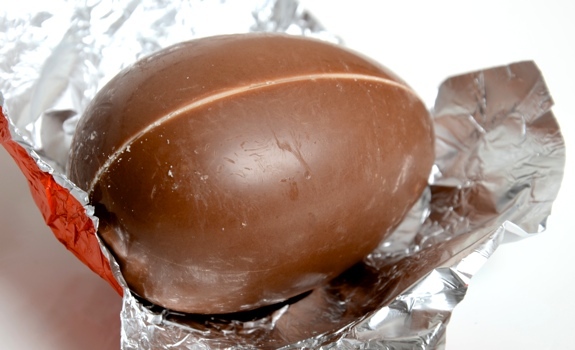 The wrapper comes off to reveal ... a milk chocolate egg that's easy to crack in half. And so, as a public service to our American readers – at least the ones who don’t hang out at illicit Kinder Surprise dens in the bad part of town, piecing together tiny toys while riding a sugar high – here’s a glimpse into the strange cultural experience you’ve been missing. The capsule inside a Kinder Surprise egg. The egg's chocolate walls are surprisingly thin. The warning! Especially important for unhappy white-chocolate chips in groups of 0 to 3. The Look: Like an egg wrapped in foil. The shell is a light brown milk chocolate on the outside, and has what looks like a white chocolate coating on the inside. Once you break open the egg’s shell, there’s a large plastic capsule containing a toy that requires assembly (instructions included). My toy? A DIY giraffe. 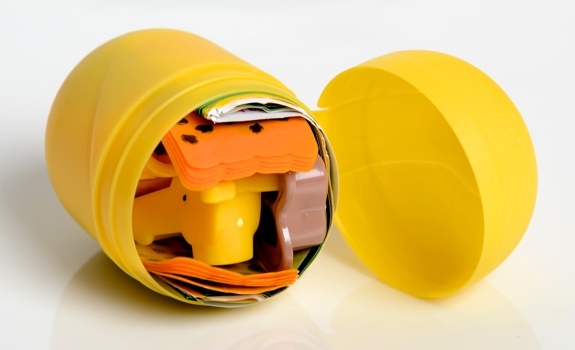 Open the capsule inside the egg to reveal tightly packed toy parts with instructions. Note: These toy parts are NOT edible. I repeat, these toy parts are NOT EDIBLE. The Controversy: Some people would like to see Kinder Surprise outlawed. Why? Because there’s concern that the toys inside the egg present a choking risk. The American ban apparently has to do with placing an inedible object inside an edible object; it’s a curious complaint, considering the popularity of perfectly legal foods like chicken wings or fortune cookies. Is the concern legitimate? Sure. But if you buy a candy with a choking-hazard warning on it, you’re probably not going to let your kid eat it on his/her own. The Taste: Sweet, milky and waxy, and there’s not much of it. If you’re buying this for the chocolate, you’re nuts. 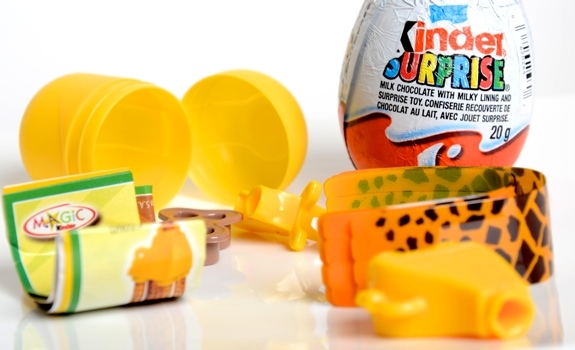 The various parts and instructions in a Kinder Surprise chocolate egg, spread out and ready to assemble. Cost: $1.40 for a 20 gram egg at Safeway in Calgary. Value for cash money: Meh. Availability: Supermarkets, corner stores, pharmacies, etc. The verdict: Despite its status as a cherished object of nostalgia, let’s call a spade a spade: It’s a crappy toy (there, I said it) wrapped in some mediocre chocolate. As for America: I love you, but you have a choice: either allow these across your border, or kindly request that your politicians and talk-radio blowhards stop accusing other countries of being freedom-hating socialist nanny states. All done. 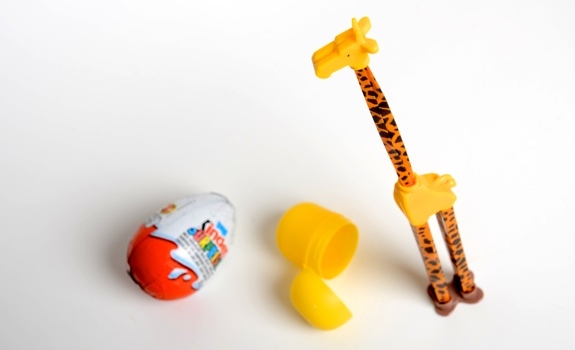 My Kinder Surprise toy was a plastic giraffe. What does it do? Nothing. It just stands there. Hi, upon my desperate search for a proper Italian traditional easter egg, I fell upon your review. Well, all I can say is, yes, us grown people eat Kinder for the nostalgic factor, but at the same time, its Americas craving for excess that doesn’t allow for enjoyment of simple pleasure of quality milk chocolate. 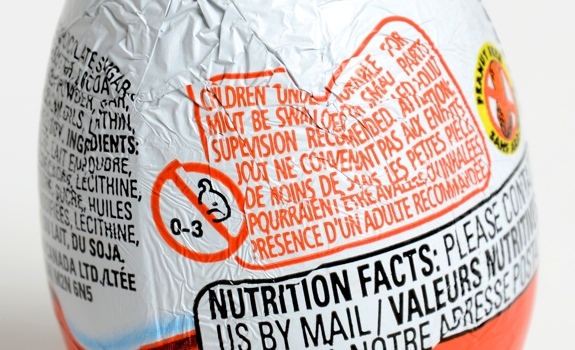 I grew up with Kinder products in Italy. Not Hershey or Mars. This country would rather have you excessively stuff yourself into guilty pleasures rather than take time to savor small sweet moments. But I hope you enjoyed the experience : ) lucky you that you can buy them! I remember these as a kid the toy is the best bit the chocolate is more like a bonus. I was s collector of kinder surprises as a child. The quality of the toy has declined a lot. I have my old ones that are made of wood (boats), metal knight atop a horse, windup cars with metal axles……now sadly they are all cardboard and plastic with no imagination behind them.